Web browsing remains one of the most popular uses of a broadband connection, and many broadband users judge the performance of their broadband connection by the responsiveness and speed of browsing. Many people assume that web browsing performance is simply determined by the speed of a broadband connection. However, this is not the case. In this blog, we’ll be showing how you can make web browsing faster, without the need to increase the speed of your broadband connection, through speeding up Domain Name System (DNS) look-ups. In this article, we'll focus on optimising the choice of external DNS server. The Domain Name System is the mechanism by which meaningful website domain names (such as www.bbc.co.uk and www.google.co.uk) are translated into the IP addresses (for example, 212.58.244.26 and 74.125.129.94) of the servers providing these websites. All web servers are assigned an IP address, which is a numerical label that is used to identify them and which enables them to be found on the Internet. While the IP addressing system is a very useful identification mechanism for computer devices, it is not a particularly human-friendly means of identification. A domain name (for example, www.bbc.co.uk) is essentially a human-friendly version of an IP address. Not only is a domain name easier for people to remember, but a domain name provides flexibility in terms of how websites are accessed on the Internet. For example, the BBC could decide to change the server providing its web pages (and, therefore, its IP address) without needing to change the domain name. When you enter a domain name into your browser or you click a particular link, it is necessary to first translate the name into a numerical IP address so that the contents of the website can be retrieved. This process inevitably causes a delay in the web page being rendered although, through optimisation, this delay can be minimised. A distributed database architecture is used with the Domain Name System, with many DNS servers located across the world to allow domain names to be translated to IP addresses for all devices is existence, despite many changes in IP addresses being made every single day. It would be impractical to have a single DNS server providing the translation of domain names to IP addresses for all Internet users in the world since a single server would soon get congested by all the DNS look-ups being undertaken. Also, broadband users located a significant distance from the server would suffer from large time delays. Many ISPs run their own DNS servers to provide domain name to IP address translation for their broadband users. In addition, a number of third parties (such as Google and OpenDNS) provide independent, so-called "Public" DNS servers. In general, most routers supplied by UK ISPs are set up to use the DNS servers operated by the ISP. This means that your browsing experience is determined in part by the performance, reliability and location of your ISP's DNS servers. If your ISP’s DNS servers are unreliable and slow (for example at peak times), your web browsing experience may be significantly affected. Furthermore, if your ISP’s DNS servers are located a considerable distance away from you, there may be significant DNS look-up delays. According to Google, with the increasing complexity of web pages that reference resources (e.g. images) from numerous domains, DNS look-ups can become a "significant bottleneck" in the browsing experience. Since many broadband users use the router supplied by their ISP (using default settings), they will be using the ISP’s default DNS servers by default, even though an alternative DNS server may provide superior performance. 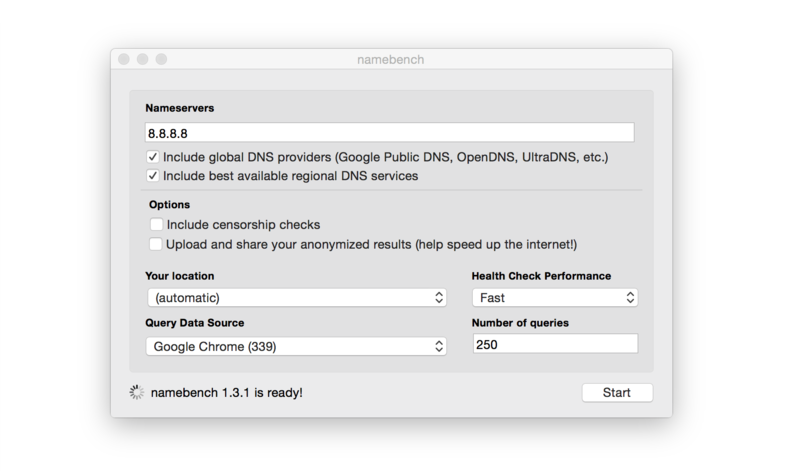 Namebench thoroughly tests the performance of your current DNS servers against a range of alternatives, to help identify the best DNS settings to use. After its testing, the software will provide recommendations on DNS settings and will indicate the speed enhancement that you would obtain by changing your DNS settings to the recommended ones. When Namebench is first run, it can take many minutes to gauge performance of all DNS servers tested. Please ensure that, while testing is being performed, your broadband connection is not being used, to ensure accurate results. Namebench outputs a great deal of information. Don't worry about messages such as "appears incorrect" or "is hijacked" as these are erroneous and point to the use of load balancing services sometimes used by large web providers. The key metric to look at in the table is the average look-up time in ms ("Avg (ms)"). Minimum and maximum values are also provided to give an indication of the spread in look-up times. The DNS servers are listed in terms of performance, with the best performing DNS server at the top. We've generally found that Google's Public DNS servers (8.8.4.4 and 8.8.8.8) perform well. However, as shown in the screenshot above, other DNS servers can be quicker depending on your location. 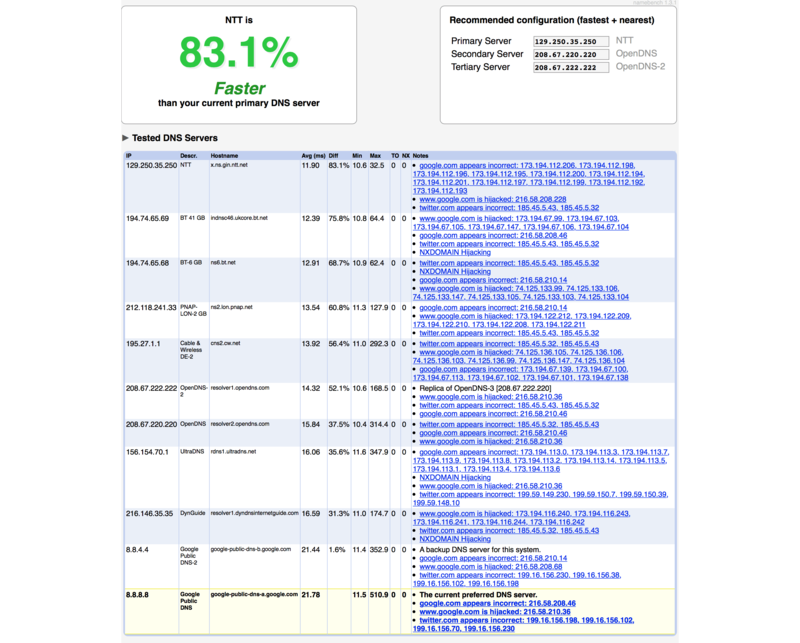 In the case above, the fastest DNS server tested was about 10 ms faster on average than Google's servers. Namebench also provides several graphs, as shown below (click for full size), which are useful in comparing look-up times. 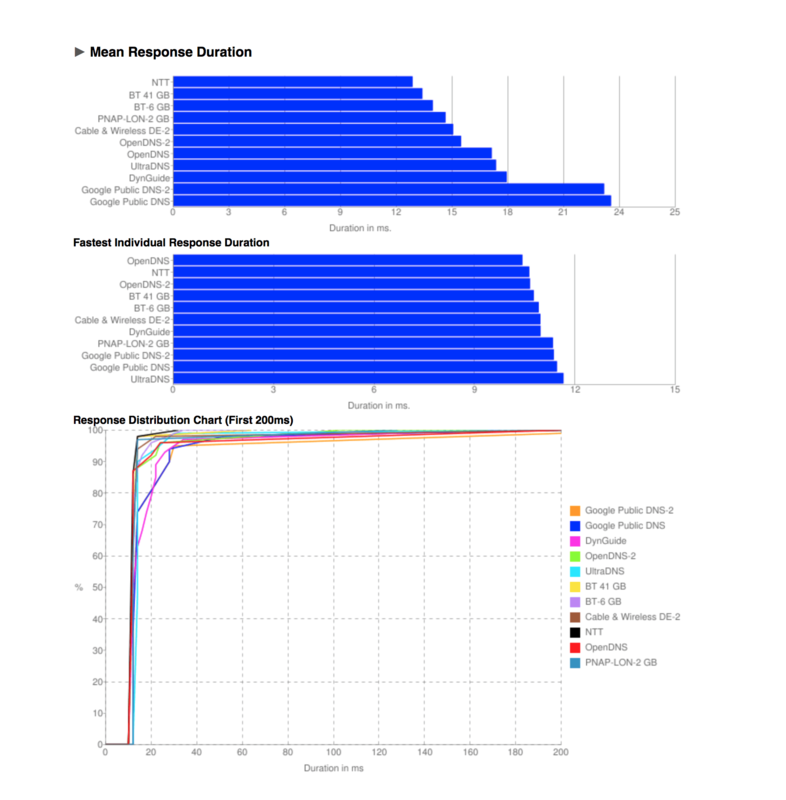 The response distribution chart (shown just above) is particularly useful at displaying the spread of DNS look-up times across all the domain names tested by the Namebench utility. In this example, all the DNS servers generally provided very fast look-ups for about 60% of the domain names tested. However, what separated the best DNS servers from the rest was the consistency of performance across all the domain names tested. We recommend that you run Namebench multiple times, and at different times of the day, in order to accurately gauge performance. Once you have identified the best possible DNS servers, you will need to ensure that your devices are set up to use these DNS servers rather than the default ones. The quickest way to change the DNS settings used by your devices is usually by changing DNS settings in your router, although annoyingly some routers (for example, the BT Home Hub) do not allow DNS server settings to be modified. As described below, it is still possible to change DNS settings in such cases on a device-by-device basis. On your router, you will probably find the DNS settings in the settings associated with DHCP. As all routers are different, you may need to look at documentation for your particular router to understand how to change the DNS settings. As an example, a screen shot for the Billion 8800AXL is shown below. 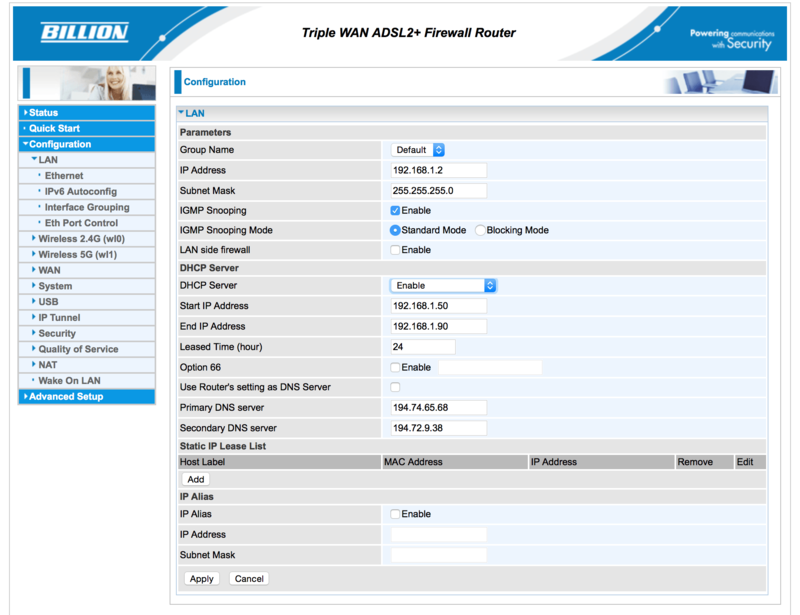 For the Billion 8800AXL, the set-up menu can be found by selecting 'Configuration' and 'LAN'. You simply enter the IP addresses of the top two DNS servers identified from Namebench. Generally, we advise you to enter two DNS addresses. In the case that a DNS look-up fails with the first DNS server, a look-up using the second (backup) server on the list will be attempted. While changing the DNS settings in the router is usually the most convenient way of propagating DNS settings across all your devices, you can manually change the DNS settings on each individual device (which can be more time consuming). This is usually very easy to do, although you may need to refer to your device instructions if you are unsure. As an example with OS-X, DNS settings can be found by going to 'Open Network Preferences' and then selecting your Internet connection followed by 'Advanced', and then the 'DNS' tab. The DNS addresses can then be entered. Don't forget to read our Increase Broadband Speed Guide to maximise your broadband speed. Did you realise that WiFi could be the bottleneck in your system? Our WiFi Optimisation Guide describes how you can minimise any WiFi slowdowns.